Chiune Sugihara, and his wife Yukiko, are honored as "Righteous Gentiles" for their efforts to save Jews during the Holocaust. A movie about Sugihara, titled Persona Non Grata, premiered in the United States on January 31, 2015, during the Atlanta Jewish Films Festival. Directed by Japanese-American director Cellin Gluck, it is a biographical film in Japanese based on the real-life heroic actions of Sugihara. Before the war, the population of Kaunas consisted of 120,000 inhabitants, one fourth of which were Jews. Lithuania, at the time, had been an enclave of peace and prosperity for Jews. Most Lithuanian Jews did not fully realize or believe the extent of the Nazi Holocaust that was being perpetrated against the Jews in Poland. The Jewish refugees tried to explain that they were being murdered by the tens of thousands. No one could quite believe them. The Lithuanian Jews continued living normal lives. Things began to change for the very worst on June 15, 1940, when the Soviets invaded Lithuania. It was now too late for the Lithuanian Jews to leave for the East. 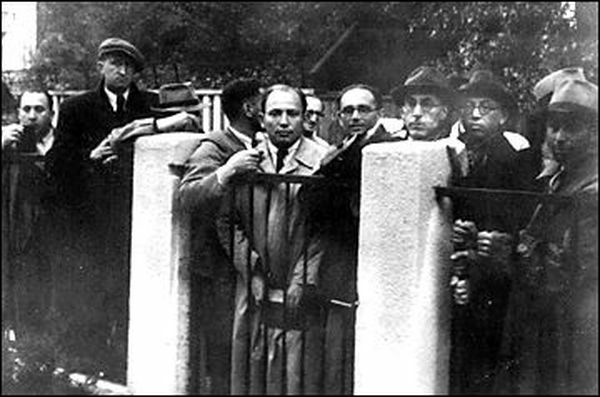 Ironically, the Soviets would allow Polish Jews to continue to emigrate out of Lithuania through the Soviet Union if they could obtain certain travel documents. them to escape to the Far East and to America or Palestine. Except for Mr. Jan Zwartendijk, the acting Dutch consul, Chiune Sugihara was the only foreign consul left in Lithuanania's capital city. They had much work to do. After repeatedly receiving negative responses from Tokyo, the Consul discussed the situation with his wife and children. Sugihara had a difficult decision to make. He was a man who was brought up in the strict and traditional discipline of the Japanese. He was a career diplomat, who suddenly had to make a very difficult choice. On one hand, he was bound by the traditional obedience he had been taught all his life. On the other hand, he was a samurai who had been told to help those who were in need. He knew that if he defied the orders of his superiors, he might be fired and disgraced, and would probably never work for the Japanese government again. This would result in extreme financial hardship for his family in the future. The surprised and delighted Consul gratefully accepted the young boy's offer, and he and his wife Yukiko attended their first Jewish Chanukkah celebration. Sugihara was also raised in the strict Japanese code of ethics of a turn-of-the-century samurai family. The cardinal virtues of this society were oya koko (love of the family), kodomo no tameni (for the sake of the children), having giri and on (duty and responsibility, or obligation to repay a debt), gaman (withholding of emotions on the surface), gambatte (internal strength and resourcefulness), and haji wo kakete (don't bring shame on the family). These virtues were strongly inculcated by Chiune's middle-class rural samurai family. Thus, Sempo Sugihara was no ordinary Japanese man and may have been no ordinary man. At the time that he and his wife Yukiko thought of the plight of the Jewish refugees, he was haunted by the words of an old samurai maxim: "Even a hunter cannot kill a bird which flies to him for refuge." Today, more than 50 years after those 29 fateful days in July and August of 1940, there may be more than 40,000 who owe their lives to Chiune and Yukiko Sugihara. Two generations have come after the original Sugihara survivors, all owing their existence to one modest man and his family. After the war, Mr. Sugihara never mentioned or spoke to anyone about his extraordinary deeds. It was not until 1969 that Sugihara was found by a man he had helped save, Mr. Yehoshua Nishri. Soon, hundreds of others whom he had saved came forward and testified to the Yad Vashem (Holocaust Memorial) in Israel about his life saving acts of courage. After gathering testimonies from all over the world, Yad Vashem realized the enormity of this man's self-sacrifice in saving Jews. And so it came to pass that in 1985 he received Israel's highest honor. He was recognized as Righteous Among the Nations by the Yad Vashem Martyrs Remembrance Authority in Jerusalem. By then an old man near death, he was too ill to travel to Israel. His wife and son received the honor on his behalf. Further, a tree was planted in his name at Yad Vashem, and a park in Jerusalem was named in his honor. A street in Netanya, Israel was named after Sugihara in June 2016, in a ceremony attended by one of Sugihara's sons, Nobuki. Prior to the ceremony, Nobuki Sugihara met with Holocaust survivors from the local communities that had been saved by his father. Consul Chiune Sugihara, age 86, died on July 31, 1986. Mrs.Yukiko Sugihara, age 94, passed away on October 8, 2008. Sources: Copyright © 1995-1997 Ron Greene. VISAS FOR LIFE: The Remarkable Story of Chiune and Yukiko Sugihara. Photographs Copyright © 1995-1996 Eric Saul and the Sugihara Family Trust. All Rights Reserved. Mrs. Sugihara's autobiography, written in 1990, has now been translated into English by her oldest son, Hiroki. The book is available through Mr. Hiroki Sugihara at 2056 Bush Street, #1, San Francisco, CA 94115, USA. Tel. (415) 776-6745 Fax. (415) 776-6775. Also see Sugihara Office Japan.